Fairy Garden Accessories are a must have to create just the right amount of fairy garden whimsy! Have you made a Fairy Garden yet? Accessories are the key ingredient to making an enchanting fairy garden. I’m sharing a few from my Pinterest Fairy Garden Ideas board. Make large Fairy Garden Mushrooms using Vintage Salt and Pepper Shakers. It’s just a matter of paint and imagination plus a trip to the thrift store. Make your fairies a Fish Hook Chandelier. This chabby chic design is by The Fairy Garden. These cute little toad stools were created by Crafts Unleashed. Would you believe they are made with door knobs! I love creativity, don’t you? There simply must be a door in every fairy garden, don’t you think? Anathemum.blogspot created this ornate fairy door with scraps! You would never know this fairy garden well is created by recycling a water bottle! My Pinterventures shared he tutorial for this project including her completed Fairy Garden. 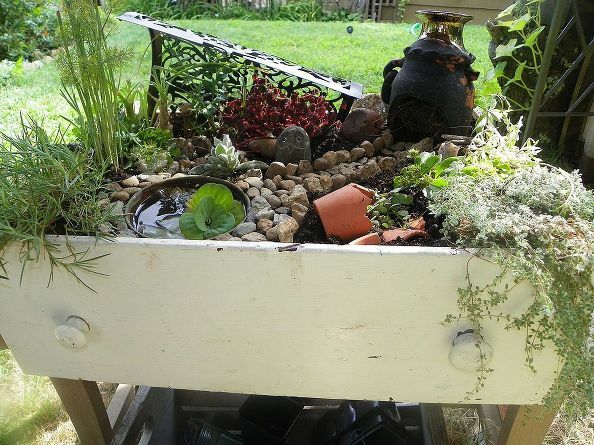 Kristen created this lush Fairy Garden in an old dresser drawer. Miss Bloomers created her fairy garden in her sons old rusted wagon. It’s one of my favorite fairy garden containers so far! This fairy house is a splendidly repurposed old boot. Pinterest. Genuinely a stick built fairy house by Juise with a complete step by step tutorial. The important thing to consider is location. Plants tend to be particular about sunlight and shade. Try to select plants with similar requirements for light and water. I started out doing some research to make my own Fairy Garden. The next thing I know, I’d created a Pinterest board and got lost in it. See my Fairy Garden Tour which includes the plants I used to create a hidden fairy garden. Follow intelligent domestications’s board Fairy Garden Ideas on Pinterest. Super Cute!! Thanks for Sharing on My 2 Favorite Things on Thursday – Link Party!! Hope to see you tomorrow!! Pinned!! These are so cute! I hadn’t heard of a fairy garden. I am swamped this year with the new vegetable garden and adding a deck but this would be a cute addition next year. The kids would love it! Shirley, this is such a cute post! Now I need a fairy garden! I just learned about fairy gardens recently and they are so cute. I shared this with my cousin because I know that she likes them too. Thanks for sharing at #AnythingGoes. Oooooooh, such charming fairy gardens! I want to go visit every one! Unfortunately, I live in an apt. and don’t have any yard… But I would love to have one of my very own. Melinda, I saw some smaller indoor Fairy Gardens. Go check out the ideas on my Hometalk and Pinterest boards. There are LOTS of ideas. Jenn, my hubby and I are making plans for a fun Fairy Garden. I wish there was a local Fairy Garden tour. I have been smitten with the whole idea. I love this roundup! Thank you so much for including my fairy garden well. 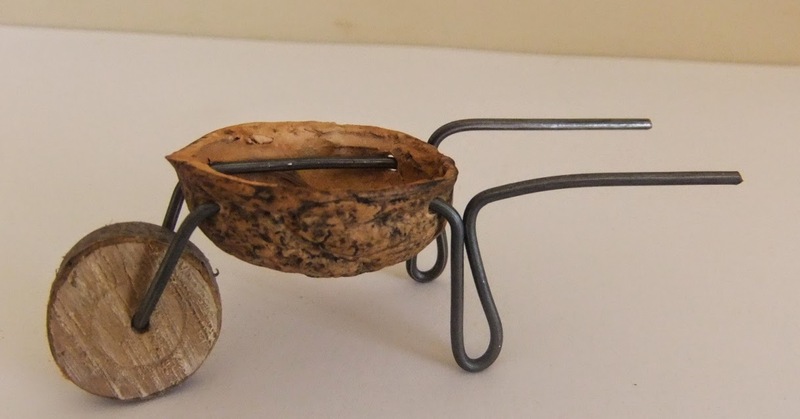 I have to make that wheel barrel and chandelier…too too cute! I’m planning on making another garden so this is perfect timing! Your fairy garden well is fabulous, one of the best DIY fairy garden projects I found. We will probably make one. It may take us all summer to complete our project. It will be fun though.